The foldable MagniLink Zip has over the years become a great success. Well known for its image quality and user friendly operation. The new generation inherits all these qualities. But they are all improved. And we added a few more. As famous as the previous MagniLink Zip was for it’s image quality – it doesn’t stand a chance compared with the new one! We combined all of our knowledge and image improving techiques with a Full HD-camera and the result is the best image quality you’ve ever seen in a video magnifier. The design has been modernized and it now follows the award winning* LVI design line, introduced with MagniLink Vision. 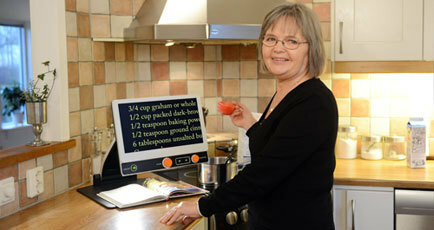 The low vision adaption is improved and the new control panel makes it even easier to use than before. This is a compact, light and easy-to-carry portable video magnifier. But it still offer the same functionality as every true CCTV, like a stable reading table with X/Y friction brakes, guiding lines, low vision adapted monitor – and a great image quality! 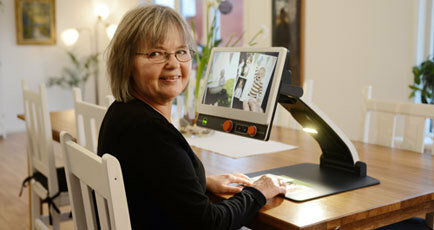 A reading camera, adjustable both vertically and horizontally is included. Light and easy The new model is easier to fold and unfold – and significantly smaller when folded (-52% height for the 13” version! ), even the 17” version!